A fugitive was flushed out by a police sniffer dog - after hiding in a portable toilet. Michael Holpin, 21, escaped from a police car in handcuffs by climbing out the window. He went on the run for two days before being discovered in a roadside toilet. Holpin, of HMP Parc in Bridgend, was jailed for ten months after admitting actual bodily harm, escape from custody, taking a vehicle without consent and driving without insurance. Holpin was initially arrested on 7 August 2018, for striking his ex-girlfriend at her home in Llanhilleth, near Abertillery, before taking her car. He told police they had the wrong man and they should arrest his twin brother. 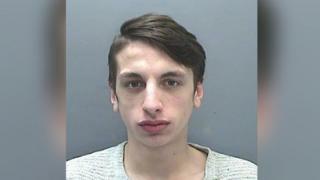 But Cardiff Crown Court heard that while offers checked his identity, Holpin fled from the locked police car and escaped. However two days later he was discovered in a Portaloo cabin on a road in Newbridge, Caerphilly, by police investigating an unrelated car crash. In a victim impact statement, Holpin's former partner said she was scared and "didn't know" what he was capable of. Jeffrey Jones, defending said there was "no aggression or violence" in his escape. Holpin, who has 24 previous convictions, was also handed a five-year restraining order prohibiting him from contacting his former girlfriend and was banned from driving for eight months.